For retro and futuristic vehicle fans alike, BMW Korea will have them covered with 29 new models showcased at the upcoming Seoul Motor Show, to be held in Kintex from Friday, the automaker said Tuesday. In line with BMW Korea’s slogan for the tradeshow -- “Connect with the future of BMW” -- BMW Korea will unveil its BMW i Vision Dynamics and concept model M8 Gran Coupe, displaying the future mobility and design direction of the auto giant. Also at the event, it will unveil for the first time in Asia an all-electric version of the classic Mini, as part of its “Mini 60 Years of Inspiration” theme. 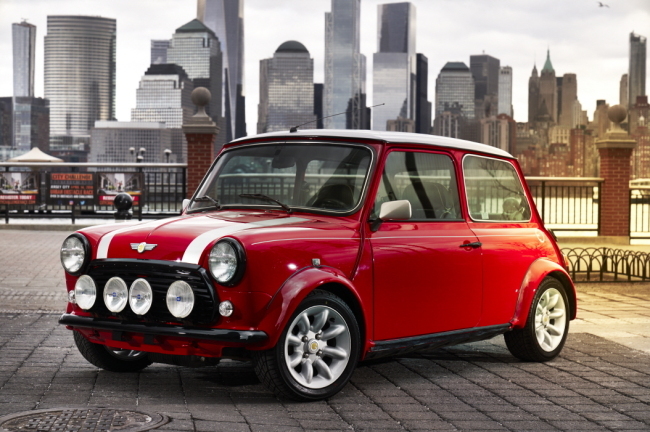 In bright red, the classic Mini Electric is not only a tribute to the 1998 Mini Cooper, but also a testament to BMW embracing advanced electric drive technology, the company said. In addition, more futuristic models include concept model M6 Gran Coupe and BMW i Vision Dynamics. Besides the models displayed, BMW Korea also planned various activities for audience engagement. “Circle of Trust” is one of the company’s new campaign aimed at promoting a culture of safe driving, and “Safety for Kids” is a traffic safety education program targeting kids aged 6 and up.